Texan Girl Talks: I ate gravel. Every monday and wednesday, I go to a boot camp. We do a lot of different exercises that include high intensity cardio as well as body sculpting. Well I wasn't able to write about this yesterday, but I ate the gravel. ATE IT. I wasn't wearing the shoes that I normally wear, which are the Brooks Pureflows. I was wearing my Nike frees, which I never knew I had any issues with.. until I was warming up today by running and BAM! My feet got tangled up and I was down for the count. I'm not gonna lie, the first place I checked were my teeth, as long as those babies were ok, I knew i'd be fine! Yes, I realize that is completely vain but I'm soooo close to having the perfect teeth!!! 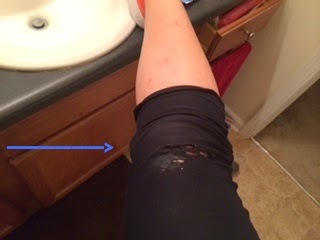 Here are some pictures of my battle wounds... Im only really showing you one real one, because the other one is a little graphic.There was definitely a flap of skin missing on the other one. Don't you worry one bit, this nursing student had it in the bag! ha! I'm also considering my FAVORITE pants part of the battle wounds too, I was so upset about them. You know you find love when you find the perfect pants that don't creep and always stay where you need them to. They are some off brand deal that I got off Groupon, I will be mourning their loss. This is actually a baseball size now. 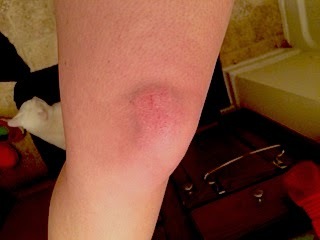 I've iced it for a good hour and taken ibuprofen.. so hopefully this will magically get better before clinical.. Yeah. Right. Yes, there was a little cat right there making sure I was ok... not meowing at me because there was a scant amount of food in the bowl. Then there was the aftermath of, "OMG are you ok?!" "Are you sure? you should just sit down for a minute! ", but there was no way in hell I was quitting. Not trying to be stoic, just trying to not come up any excuses to not workout. SO yes, I licked (not actually, lol) my wounds and kept going. I was going to finish the damn workout. I am tough as nails (most of the time). So of course in this workout we were doing TONS OF SQUATS and tons of things that required me to kneel on my knees... isn't that how it always goes?! I promise I will take a picture of the white board next time with the workout on it. It's really great and I always feel like I get the best workout with these ladies. Workout peeps stay safe! Always wear the right shoes! Have you ever fell out during a work out? Did you keep going?! Did you have any crazy injuries from working out?! Your injury looks so sore, hope it heals fast! It is! Thanks girl me too.